Why should you choose Computer Science & Engineering? 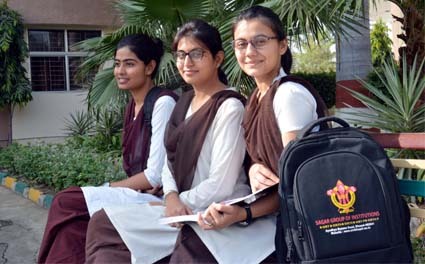 Department of Computer Science & Engineering (CSE) of SIRT has started in the year 2003 with an initial intake of 60 students and now it has been increased to 180 students. The Department of Computer Science & Engineering offers B. Tech in Computer Science and Engineering & M. Tech. courses in Computer Science and Engineering. Currently, the Intake of the Department for UG is 180 and PG is 24. It has been accredited by National Board of Accreditation in 2009 and 2014. The student chapter of various professional societies like CSI, ACM, and IEEE are active throughout the year to develop and support co-curriculum and extra curriculum activities among the students. The Department not only provides state of the art computing facilities to the students but it also provides knowledge to students with the latest technologies and practical exposure so that they can make their presence felt in the latest technical revolution. To evolve as a center of excellence of international repute in technical education, training and research and to be prepared to adapt to emerging technologies across the globe..
To provide quality education in the domain of computer science & engineering. To achieve excellence in technical education through effective teaching learning process and impart managerial skills to the student to make them suitable for technical industries. To prepare students for higher studies and make them capable to design and develop solution through innovative ideas for benefits of society. Dr Rajesh K Shukla is PhD in Computer Science and Engineering from RGPV Bhopal. He has completed MTech and BE from SATI Vidisha. During the teaching experience of approximately 19 years, he has authored 8 books for Computer Science Students which have been published by the publisher of International Repute Wiley India and Cengage Learning. His books have been recommended by various Universities as text Book as well as reference Book.